A couple months ago, while I was looking at my instagram feed, I came across the most amazing/crazy/insane quilt pattern I have ever seen. I was so intrigued by it and put it onto my to-do list right away! I love how all of the "cogs" intersect and connect. Amazing!! 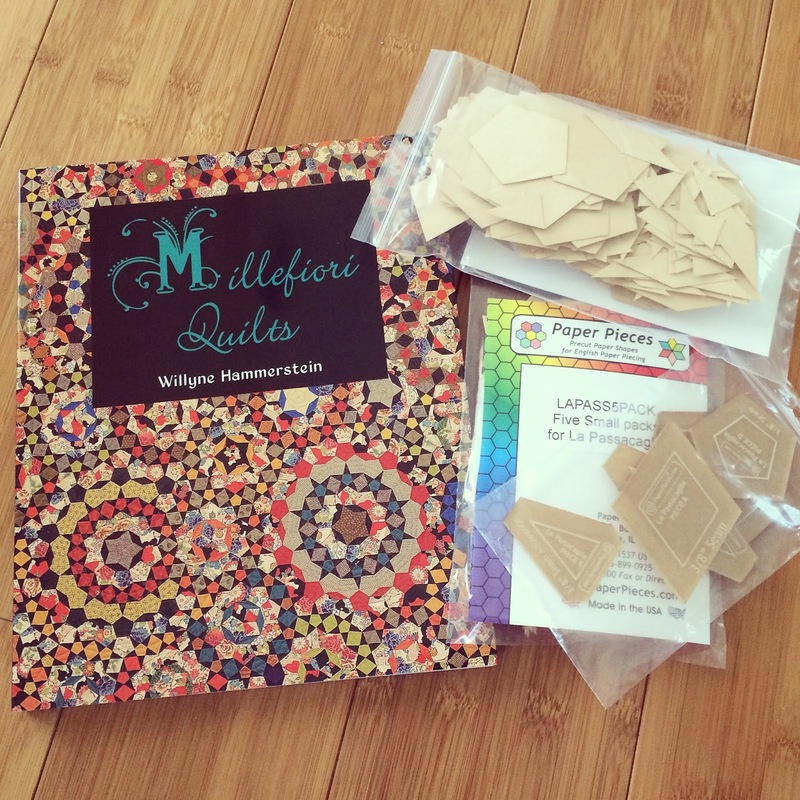 After looking into it a bit, I found out that the pattern was the La Passacaglia from the Millefiori Quilts book by Willyne Hammerstein. The book is written in both French and English and it is insanely amazing! I can not believe the 19 quilts in this book. Simply incredible! The book is super hard to find here in the U.S.- but last month PaperPieces.com remedied that and had 200 copies shipped from France. YAY! They also did all of the hard work for us and they sell pre-cut card stock paper pieces and acrylic templates to cut your fabric... and believe me- with a quilt that has approx 2900 pieces, they are a must! There is no way I could accurately cut out my own pattern pieces, so I am so happy to let them do the job! I am not quite done with my first cog yet, but I am loving making this quilt every step of the way... well maybe except for those tiny stars!! It is a lot of work, and a huge time commitment, but I just plan to work at my own pace and enjoy the process! As for my color scheme... I am not sure... I am thinking I may have a bit of every color of the rainbow. 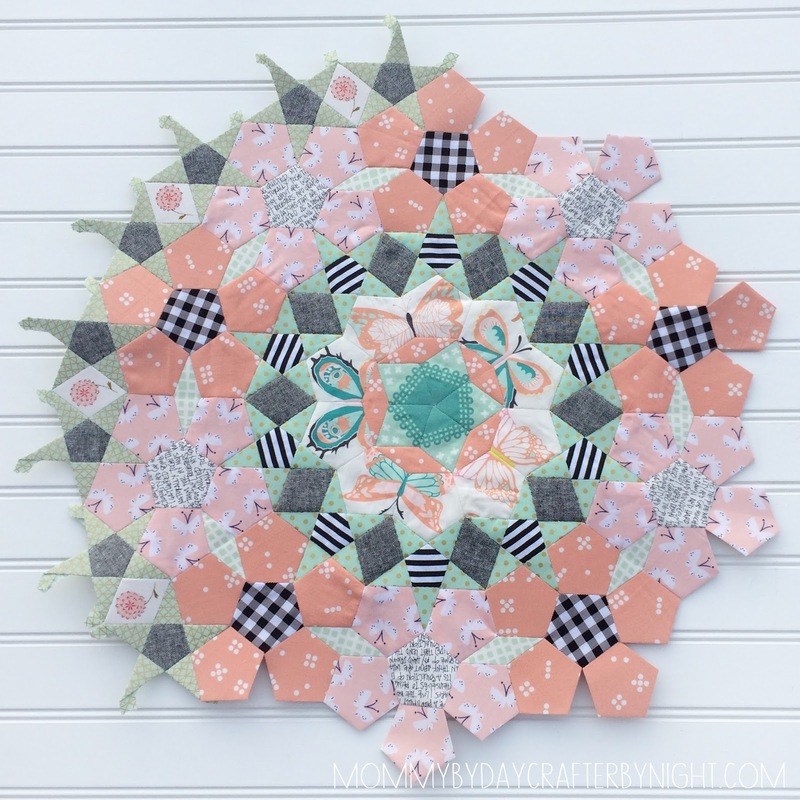 I gotta embrace the craziness of the quilt! 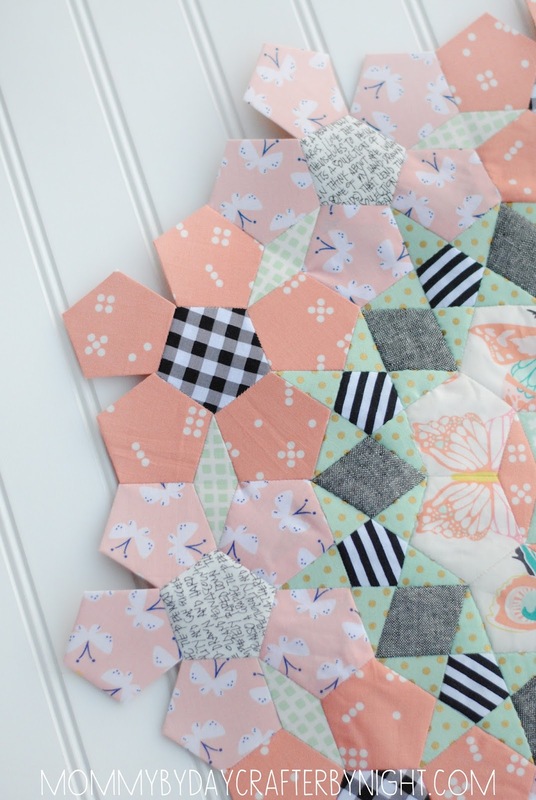 be sure to check out the gorgeous quilts and happenings on Instagram! P.S. Thanks to everyone who entered thePolar Notion Board giveaway on my blog over the weekend.. One winner was chosen at random and the lucky lady is Dixie. Wow - I have wanted to try out those babies on my stash!!! When it comes to fabric storage, I love organization and neatness. Nothing worse than shoving your beautiful fabrics in a bin or closet where you have to dig through them every time you need something! Last year, after getting sick of doing just that- digging through bins, I decided to make a sewing shelf dedicated to storing my notions and patterns. I knew that I wanted to have mini "fabric bolts" to store my fabric on and at the time, the only thing I could find that would work were cardboard comic book boards. They worked alright, but since they are made of cardboard, you can imagine that they aren't very sturdy and bend easily- especially if I have more than a yard of fabric on the board/bolt. 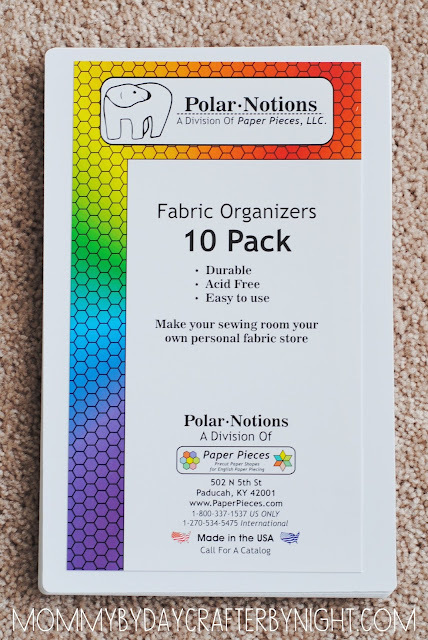 A couple weeks ago, I was contacted by one of my favorite shops- PaperPieces.com and they wondered if I wanted to try out Polar Notion Boards. I was intrigued so I said "yes" and they sent me one 10 pack of the plastic boards to try out. I was skeptical at first because my boards were working fine, but once they arrived I was sold. They are made of a stiff plastic and the fabric wraps around them so nicely! Not only that, but they are acid free... so they aren't going to damage your fabrics over time. 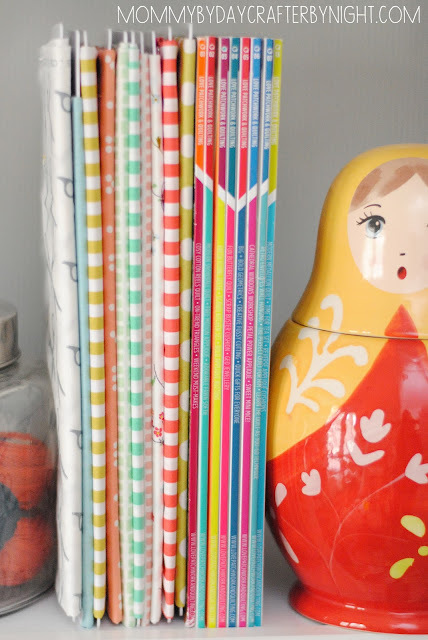 I got the original size and they are just the right size- about the same height as my favorite quilting magazine, so they fit perfectly on a book shelf. They do have smaller sizes though if you are looking for fat quarter size bolts. How cute is that!?! I just love them! I can't wait to order more to replace my bent up cardboard bolts. I love how you can go from a pile of unruly fabric to your own personal "fabric shop" of neatly organized fabric bolts. 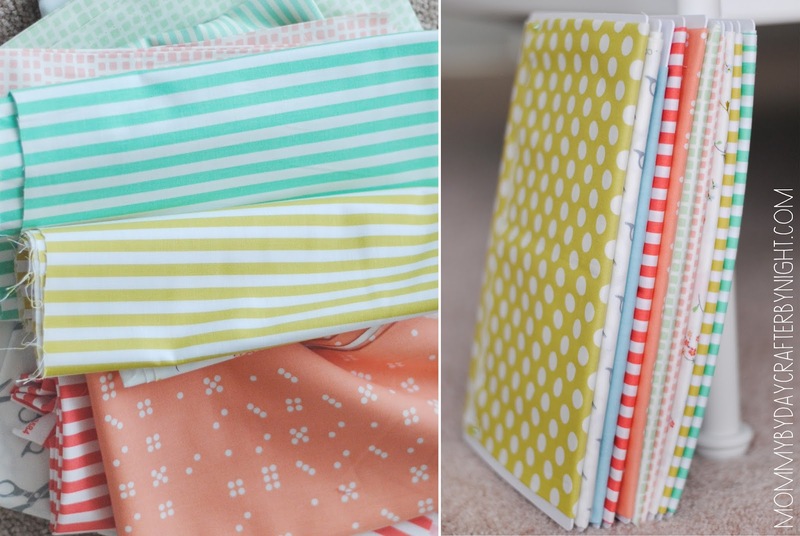 It really is the perfect answer to fabric organization! And SUPER BONUS- They are giving one lucky Mommy by day... Crafter by night reader a 10 pack of either size Polar Notion boards try out!! All you have to do to enter the giveaway is leave a comment with your email and I will choose a winner Tuesday November 18.